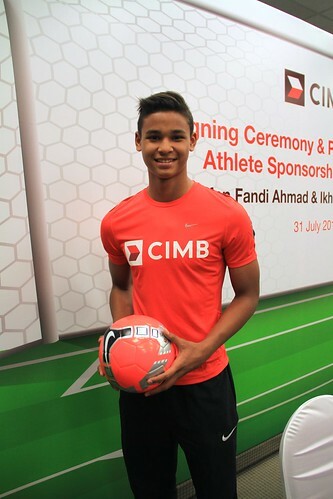 The eldest son of football legend Fandi Ahmad, Irfan, is a sponsored athlete and one of the top young footballers in Singapore at just age 17. What is it like chasing the football dream? Most little boys at age 9 or 10 while away their childhood playing computer games, trading Pokémon cards, and harbouring nebulous dreams of becoming an astronaut, a firefighter or other assorted heroic figures, which usually bears no fruition when they enter adolescence. But not Irfan Fandi Ahmad. As the eldest son of Singaporean football legend Fandi Ahmad – one of the heroes who led the national team into sporting glory during the Malaysian Cup championships in the early 1990s – Irfan started playing football at just two years old, and has not stopped since. By age 9, his young eyes had already pictured clearly the future path he was sure he wanted to travel on for the rest of his life. IRFAN (RIGHT) IN A 25th LION CITY CUP MATCH HELD AT JALAN BESAR STADIUM ON JUNE 12 LAST YEAR. "My dream, then and now, is to become a professional footballer in Europe, and come back to my family one day and give back what they gave to me," confided the strapping, 1.86m tall teenager. FANDI AHMAD PROUDLY SENDING HIS SONS OFF AT THE AIRPORT IN MARCH 2013. The 17-year-old reverently hailed his father as his main motivation and driving force. "I admire my dad's playing style. My dad was a team player, not an individualistic star player who only pursued personal glory," said the young striker. "I want to be like him, and one day, surpass him." IRFAN WITH HIS PARENTS, WHEN HE WAS A WEE LITTLE TODDLER. 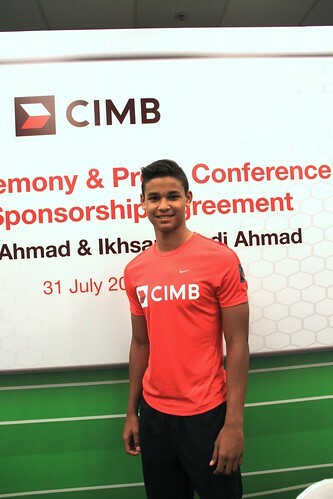 Despite Fandi Ahmad’s illustrious sporting career, there was no pressure on Irfan as a young child to follow in his father's footsteps. "Football was a casual weekend affair with the family," Irfan insisted. "We played just for fun." It was not until R. Sasikumar, a Fifa agent and close friend of his father, talent-spotted Irfan and his brother Ikhsan six years ago and kick-started their professional career, when football turned from a twice-weekly playtime affair to daily hard training. HIS INSTAGRAM ACCOUNT, WHICH HAS OVER 21,000 FOLLOWERS, BOASTS MANY PHOTOS OF HIS RIPPED PHYSIQUE AND MODEL-LIKE GOOD LOOKS. An Anglo-Chinese School and Singapore Sports School alumnus, Irfan is finishing up his 'O' Levels in Chile, and training with Universidad Catolica, a club in the top tier of the Chilean league. Prior to that, he had also spent some time in Spain and England. With his brother Ikhsan, he has represented Singapore in various international football tournaments, including the Canon Lion City Cup and the Asian Youth Games in Nanjing, China. The brothers were also the youngest of the 20-man Under-23 squad that went for a 16-day training trip to Salzburg, Austria, in preparation for the Suzuki Cup defense and next year's Southeast Asian Games. 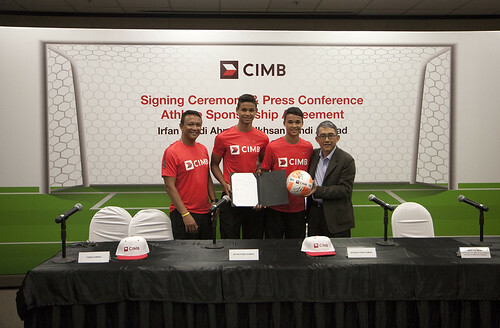 FANDI AHMAD AND HIS SONS, NEWLY SPONSORED ATHLETES IRFAN AND IKHSAN, WITH CEO OF CIMB BANK SINGAPORE MAK LYE MUM AT THE SIGNING CEREMONY LAST MONTH. 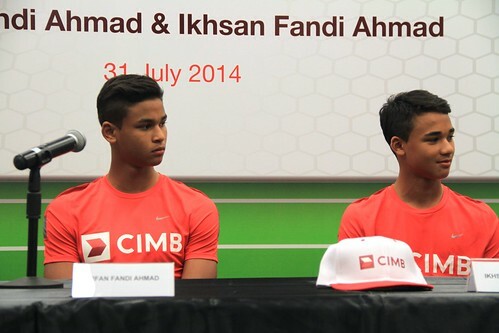 Recently, both Irfan and Ikhsan clinched a 'six-figure' sponsorship deal from banking group CIMB that will cover their living expenses, schooling and training in Chile. "We feel very lucky to have sponsors at such a young age," said Irfan. IRFAN AND IKHSAN WITH THEIR MOTHER, SOUTH AFRICAN MODEL WENDY JACOBS. When asked about how he copes with the stresses of juggling his studies and his sport, he replies without hesitation: "My family is always behind me, taking care of me when I need them. My friends are also always supportive, lending me moral support in the form of good-luck wishes before every big match." AT THE PRESS CONFERENCE, IRFAN BROODINGLY PLAYS IT COOL WHILE HIS AFFABLE BROTHER IS QUICK TO BREAK OUT IN SMILES. Besides his father, Irfan's football idols include Zlatan Ibrahimović, the striker for French club Paris Saint-Germain and captain of the Swedish national team. "He is big and strong, and he scores wonderful goals," Irfan explains. So, what can he, and his team mates and other aspiring young footballers back home, learn from his experiences overseas thus far? "The players [we trained with] have great dedication and undying hunger for the sport. Football is their life, the only thing they want. It is everything to them. This spirit is something I can learn from."